I have always enjoyed cooking and entertaining for friends and family. I enjoy finding new recipes, setting the table, and welcoming friends into my home. The laughter and conversation that happens when friends gather around a table and break bread together is truly a moment of grace. André House volunteers work hard to make spaghetti. In that way my transition into the kitchen of André House was very natural. On the other hand, cooking for 600 is a little different than cooking for six. André House is a hospitality center in downtown Phoenix. At André House, we provide basic need services to the homeless population. This includes clothing, showers, laundry, hygiene products, blankets, phone calls, Bibles and rosaries, backpacks, and sleeping bags. 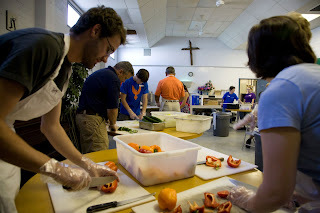 Our largest service each day is dinner where we average 600 trays of food per day. 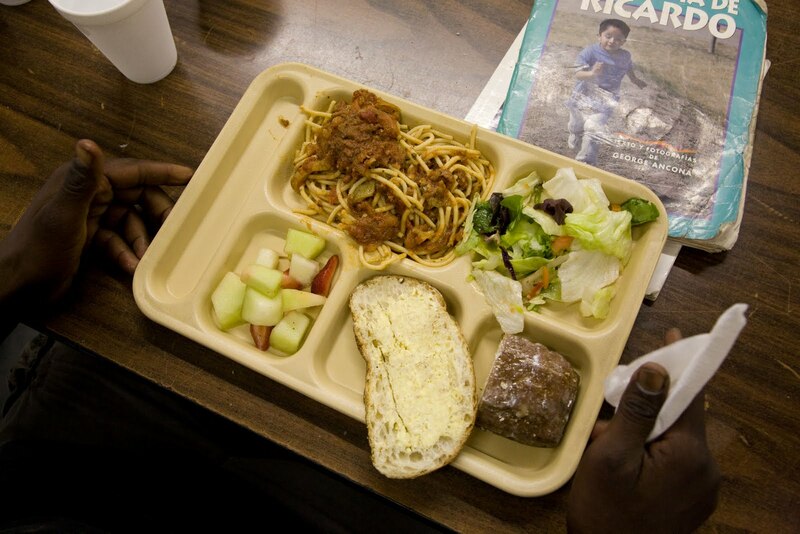 In many ways 600 trays of food is very impersonal; each person and each tray becomes a number. Yet, at André House we try work hard at creating a welcoming and personal atmosphere in the same way we would for a family dinner. The people we serve are truly our guests, our neighbors, and our friends. We start each meal from scratch. Fresh vegetables picked up from the food bank, fresh bread donated from a bakery, and 40 pounds of frozen ground beef serves as the base for each meal. Each day we serve a fresh lettuce salad and many days we have a fruit salad as well. Anywhere from 20-40 volunteers come each day to chop 50 pounds of onions, slice 1200 slices of bread, wash lots of dishes, and stir the 30 gallon pots. As you can imagine, there are many opportunities for things to go wrong. On Easter a few years ago we basted the Easter hams with hot chocolate instead of ham juice. It just gave the ham a little extra sweetness. About a month ago, I lit my hair on fire while attempting to light the large, gas burners. Luckily volunteers were nearby to help before the problem was out of hand. We also have our fair share of messes. Have you ever spilled 15 gallons of cooked oatmeal? It is a hot, sticky, runny mess. Yet, everyday the blessings outweigh the stressors. I remember one night when a guest showed up late to dinner and we were not able to serve him. Rather, another guest who had a tray of food asked for an empty tray. The guest who had food carefully and deliberately cut his hot dog in half, split his beans, potatoes, lettuce salad, fruit salad, and donut in exactly half and offered half his food to this late, yet hungry guest. Silently they shared a meal and truly broke bread together. Moments like this are amazing reminders of the presence of God and God’s subtle workings in our lives. On any given night as I walk through our main dinning room I can see small groups of friends sitting down together, praying together, and sharing their meal with smiles and laughter. It is not so different than when I sit down and share a meal with my friends. o When the pasta is still rather firm, shut off the burners. o Use a strainer to transfer the pasta to the colanders. o Rinse the pasta with cold water. Work out any large clumps with your hands. – Peel 50 lbs. of onion. Soak the peeled onions in ice water to decrease their potency. o Add onions and mushrooms to the sauce. Cook for 20 minutes on high heat with the lid on. o Continue to cook on low heat. Stir often. o Add 2 cups of sugar to each pot. – Add sauce to pasta, cover with foil, and keep in the oven.